Here at Cassell's, we specialize in Musical Instrument Repair. Our staff is experienced in many types of repair and we have highly skilled technicians to handle delicate repairs. Here are just a few of the services we offer. After graduating from The London Metropolitan University School of Musical Instrument Design in 1987 she came to the United States from England toet up shop as a luthier. For the past 27 years she has been building, customizing, and repairing stringed musical instruments in the L.A. area and she has been able to establish a large base of extremely satisfied guitar clients. (Many well-known performers and studio musicians bring their guitars to Tina to be setup before every gig.) Tna has also been paying guitar for 30+ years and plays in the bands Thundherstruck and Hammer of the Broads. We count it a privilege that Tina is part of our Cassell's Music team. Please e-mail us if you have any guitar tech questions that we can pass on to Tina. Check out this link to Tina demonstrating how to fix a broken electric guitar string. 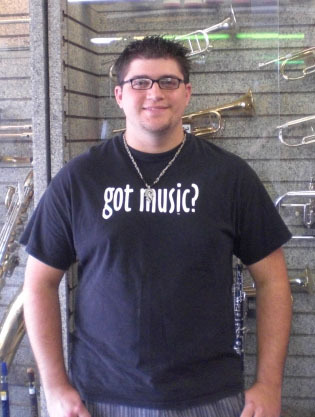 Shawn is a woodwind/brass repair specialist. He has a Bachelor of Music degree in Clarinet performance and is a graduate with honors from Renton Technical College with a certificate in Band Instrument Repair Technology. He has studied a wide range of repair techniques on many instruments.